Early-morning BART commuters got their first taste of life without 4 a.m. service, and the results were -- well, mixed. Most of the district's Early Bird Express buses, which serve 18 stations on both sides of the bay, got to their pickup points and destinations on time. But bus service at four East Bay stations suffered first-day hiccups, including one involving a bus driver who got lost en route to his pickup point. In San Francisco, BART staff handed out tchotchkes -- little BART dolls, Clipper card wallets and BART hand sanitizer, among other items -- to the first early-bird bus riders arriving at the temporary Transbay Terminal at Folsom and Beale streets. One of those on hand to greet riders: Bevan Dufty, president of the BART board of directors. He reiterated BART's message that cutting the hour of service from 4 a.m. to 5 a.m. is crucial for a 42-month seismic retrofit of the Transbay Tube -- and that the agency wants to hear from riders about how the early buses are working. "This is a listen-and-learn phase," Dufty said. "We are rider-focused, and we really appreciate the sacrifice that our early-morning riders are making. ... We have a responsibility to ensure the integrity of our Transbay Tube and to make it safe for generations to come." BART spokeswoman Anna Duckworth said that the bus service, which involves eight separate transit agencies shuttling passengers to and from the temporary downtown terminal and San Francisco International Airport, suffered a few stumbles. A bus scheduled to pick up passengers from BART's El Cerrito del Norte Station at 4:35 for a run to the temporary Transbay Terminal in downtown San Francisco was 20 minutes late. The Golden Gate Transit bus, under contract to BART, had gotten stuck on the wrong side of a railroad crossing gate in Richmond. The delay prompted most of the scores of riders who had begun lining up around 4 a.m. to seek some other way to work -- either by driving or by giving up and waiting for the first scheduled Richmond-Millbrae BART train to arrive a few minutes after 5. 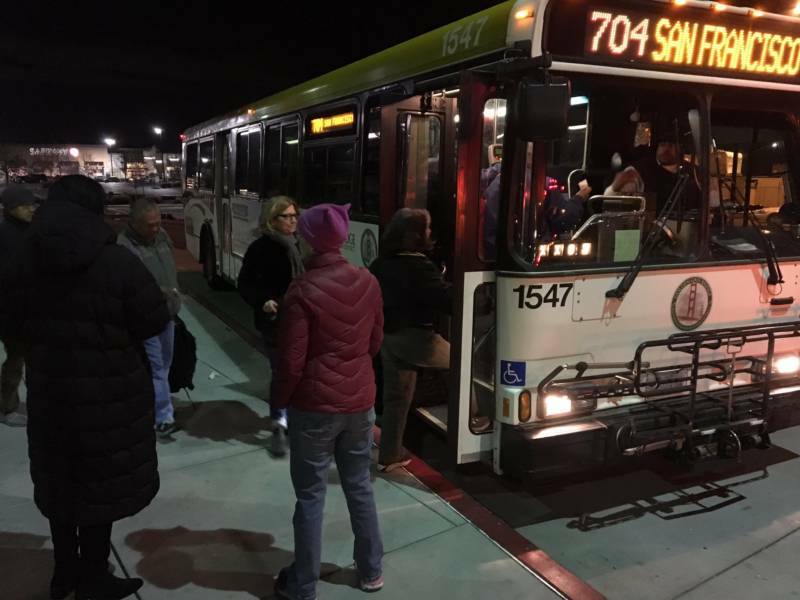 About 100 people had lined up at Pittsburg/Bay Point Station at 3:30 a.m. -- 45 minutes ahead of the first scheduled bus departure at 4:15. Some passengers were left behind, and Duckworth said that on Tuesday BART plans to have the first two buses leave at 4:15, with a third leaving at 4:30 a.m. The first Antioch bus was seven minutes late. The first Pleasant Hill bus was delayed by a driver who got lost. BART didn't have an immediate count of early-morning bus ridership. The agency says that average weekday ridership during the 4 a.m. to 5 a.m. hour has been about 2,900. Would-be bus passengers also arrived early at El Cerrito del Norte, where the temperature dipped into the 30s, to see how the substitute transit system would work. Ron Capell, a Vacaville resident who was on his way to work at the Department of Homeland Security, was one of a couple of dozen of people already in line at BART's El Cerrito del Norte Station at 4:10 a.m. -- 25 minutes ahead of the first bus's scheduled departure. Capell said he arrived early "just to observe the process and make sure I'm able to catch my bus into work." Lydie Hammack of El Cerrito, who works at a bank in downtown San Francisco, was also in line. "I'm just worried that if the bus is not on time, I'm going to be late at work," Hammack said. She also expressed concern that the two buses scheduled to take early-morning passengers to the city would be enough to accommodate all the passengers she normally sees on predawn BART trains. "Now they only have one or two buses? ... I'm worried that there's not going to be enough buses to go," Hammack said. As the scheduled 4:35 departure time arrived, two Berkeley cyclists expressed some impatience with the commute they saw shaping up. The bus "should've been sitting here, waiting for us," said Janie Hillyer, who was on her way to her job on a San Francisco Municipal Transportation Agency street-striping crew. "We left home 40 minutes earlier than we normally would leave," said Patricia Erwin. "And we've been standing here for half an hour and it's less than 40 degrees." BART personnel told the crowd that the Golden Gate Transit bus that was supposed to take them to the city had gotten delayed at a railroad crossing nearby. Erwin and Hillyer, along with most of the people in the line, wound up giving up on the bus. Many made their way up to the station's train platform, where signs showed the morning's first train was just minutes away. At 5 minutes to 5, two buses arrived. The remainder of the bus line -- maybe 15 people -- boarded the first and departed.